The sun beamed down on Fairhaven Golf Club as its new captain Colin Jakeman and lady captain Helen Miller presided over their inaugural drive-ins. Jakeman and Miller take on the jackets for 2018 as the summer season gets into full swing. 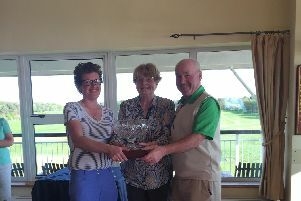 A club member for 23 years, Jakeman led his captain’s team to victory over vice-captain Michael Franklin’s team. Jakeman is honoured to take up his new position and said: “I was born locally, went to King Edward VII School and have always enjoyed sports. “After leaving school I played cricket at St Annes and Lytham before concentrating on playing rugby at Fylde. “During this time I played golf occasionally before I joined Fairhaven in 1995. “I have represented the club in various teams and have been a council member for the last three years before becoming captain. “The weather was sunny and warm and we had a good turn-out for the traditional captain’s breakfast. “This included my wife Ellie and three daughters – Sophie, Annie and Millie – who were there to enjoy the celebration. “Following the drive-in there was a full field for the captain’s versus vice-captain’s team match, with my team the winners. Miller also has a rich sporting background, having joined the club 18 years ago. The Scot, who served on the committee before taking on the role, is looking forward to the year following her drive-in. She said: “I have lived most of my life on the Fylde coast. I have always been interested in sport and had golf lessons while I was at school. 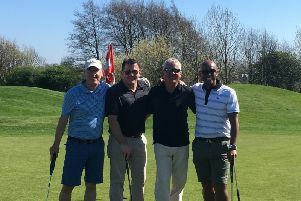 “I did not pursue this when younger because I was involved in many other sports, but those lessons stood me in good stead when I took up golf again and joined Fairhaven Golf Club in 2000. “I have served on the ladies’ committee for five years before becoming lady captain. “The weather cleared just in time for the drive in. “Family and friends attended as well as many Fairhaven members, whose support was much appreciated.